You know, I have shared the 'before' of our kitchen several times on my blog... and I always have to pause and wonder why in the world I thought that THIS house was THE ONE. You know the story... it was full of issues- one room after another. It was vandalized. It was neglected. It had no ceiling at all in places. It was simply put... broken. but what it could be. And that is definitely where we were with this house and with the kitchen when we decided to jump in and give it a go. We needed to find a way to make all that cottage kitchen potential shine. that we could do and that wouldn't cost a fortune. Because, when you have an entire house to fix or refresh- budget is key. we found a second home. and who helped me scheme up ideas for renovations. It was called Lowe's Home Improvement. 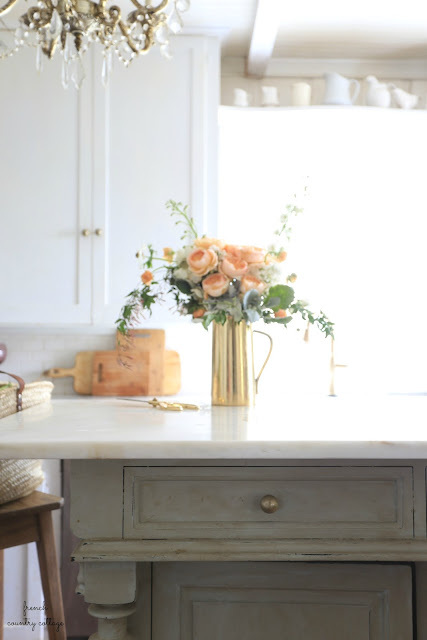 And today, I am sharing 5 simple updates that you can make in your kitchen that will warm it up, give you a ton of cottage style and charm and that won't break the bank. Of course fresh paint is always a good idea- but here are a few others. Hardware is like jewelry- pick the right one to go with that pretty new outfit and it finishes it perfectly. Pick the wrong one... and well, it just doesn't work well. I love a brassy finish on the hardware- but you can choose any that you speak to you and your style. 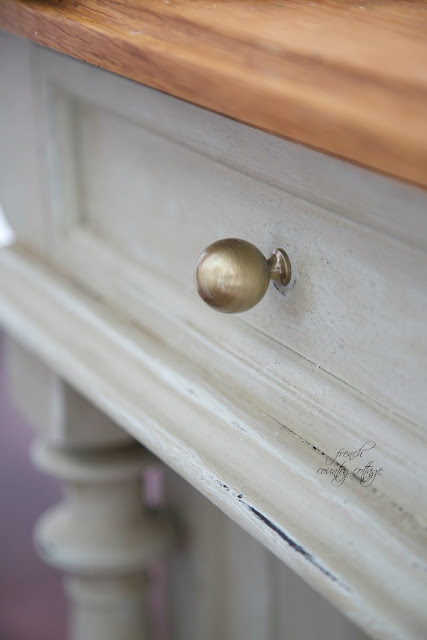 Choose all knobs- or a mix of knobs and pulls for a custom look. We didn't have an island when we moved in- but we did have a very long, large kitchen with not enough working area or counter space. We needed somewhere to chop veggies, work on homework while cooking and just enjoy a spot for the kids to sit for breakfast. A farmhouse island was perfect. with style and charm- was an easy fix. and even change the island top down the road if you want and it will look like it always belonged. Such a simple update but one that makes a huge difference. We had beaded board panels that we had cut to use as the backsplash to cover old gaps in boards and old damaged areas. But that bead board just wasn't the look we were going for. 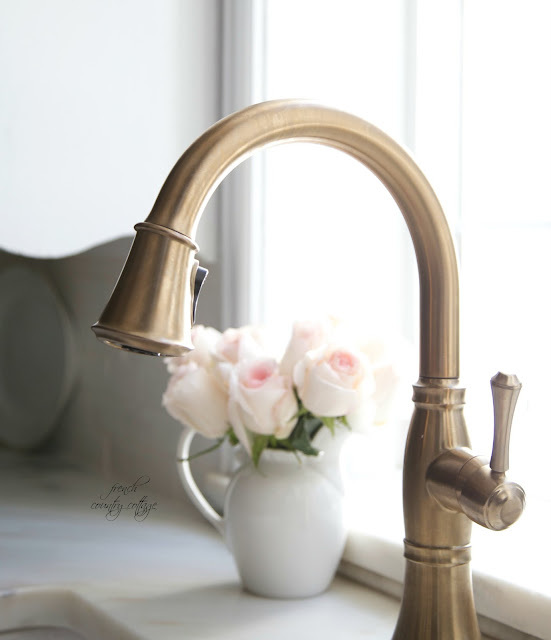 Your kitchen faucet is another thing like the hardware. It has a job to do of course- and it is a pretty important one- but it also can be pretty while doing it. 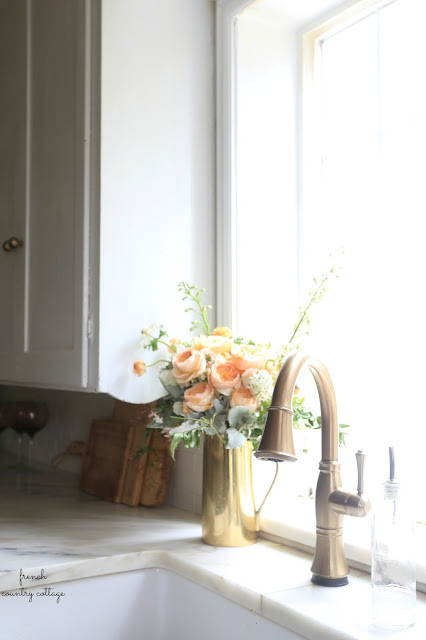 Whether you have an older home and classic style- or prefer something sleek and modern- a faucet can make a huge difference. This one has a touch sensor- which is pretty awesome for walking over and tapping with your arm if your hands are dirty. I had dreamed of one of those luscious farmhouse sinks in the kitchen for awhile... you know the ones- with the extra deep basins, the pretty front and old nostalgic style and charm. So pretty. And farmhouse style sinks aren't just for farmhouse kitchens. Changing from a regular sink to a farmhouse style sink when we updated made a huge difference in not only how the sink functioned- but also in the overall style. Some of these updates do require some knowledge of construction or plumbing- but another thing you can find at Lowe's while shopping for cabinets or the next big renovation? The right person for the job to help you out. They do have a team of professionals that they can connect you with to make your renovation dreams come true. We have a couple more updates planned for our kitchen- and I will be sharing them along the way. 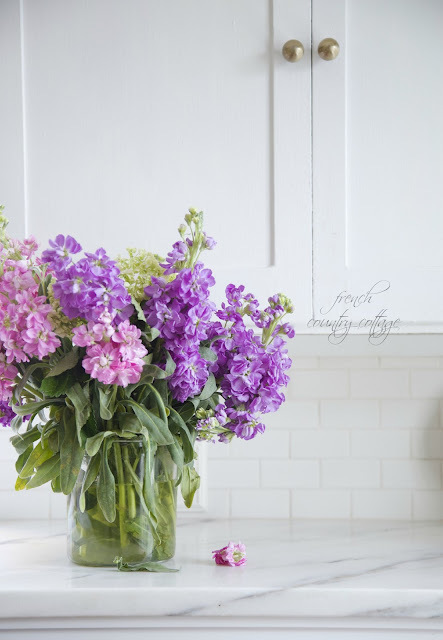 Shop the image for links to the products I love for the kitchen refresh- and right now- Lowe's has a Kitchen and Bath event with up to 40% off running through March 23rd. And that is a good reason to get moving on those projects, right? 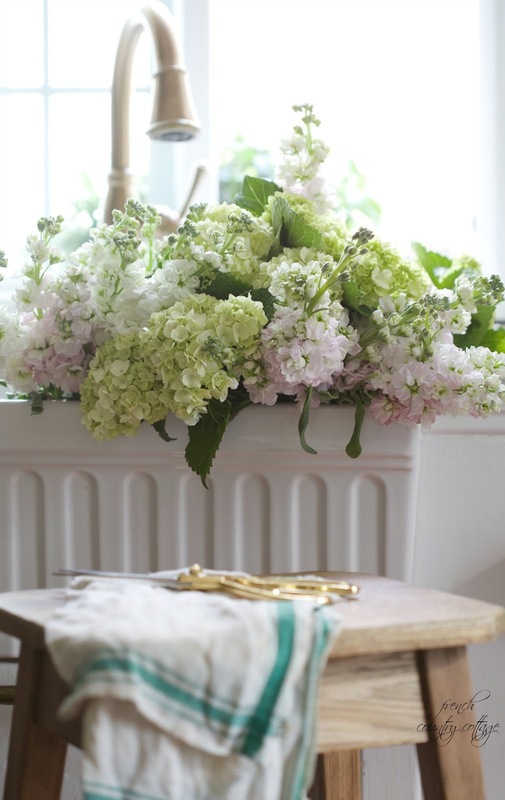 and all the details on that pretty bouquet. but all opinions and love of my Lowe's family are my own. Hi Courtney, Your kitchen is beautiful! Thanks for the info on Lowe's. My husband and I have been wanting to update our kitchen and bathrooms, so this may be the perfect time to start. Happy Wednesday to you! 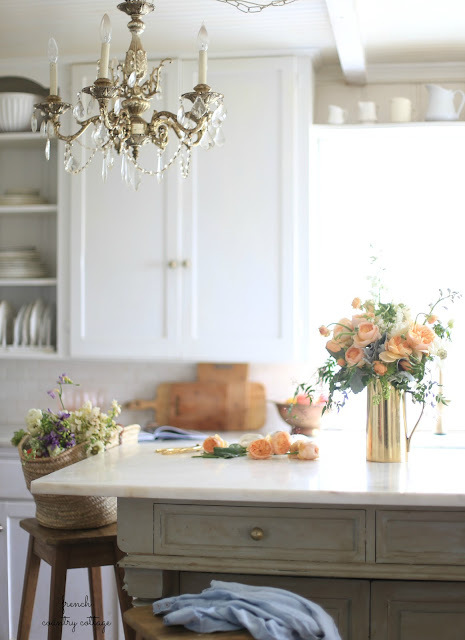 All I can say is that your kitchen is perfection....the perfect island and sink for that farmhouse look, the perfect amount of bling in the chandelier and the faucet...and of course the jewels in the hardware!...The kitchen has certainly been given new life by you working your magic! Your kitchen is absolutely stunning! What a beautiful space! You have done such a wonderful job, and the tips you shared are perfect! Your kitchen is too cute, thanks for all the info. is very helpful.. I love your sink and your got it for an amazing price. Subway tiles are great for any style kitchen I think! Thanks for stopping by Rose! Your kitchen is so pretty, love idea of using a farm table for an island and the flowers look awesome. This kitchen is lovely. I love the open dish rack to the right of the sink, and the high display shelf above the window. Love that you partner with Lowe's. They are my go-to source for home improvement. Love all of the updates!! Provides so much inspiration without breaking the bank! 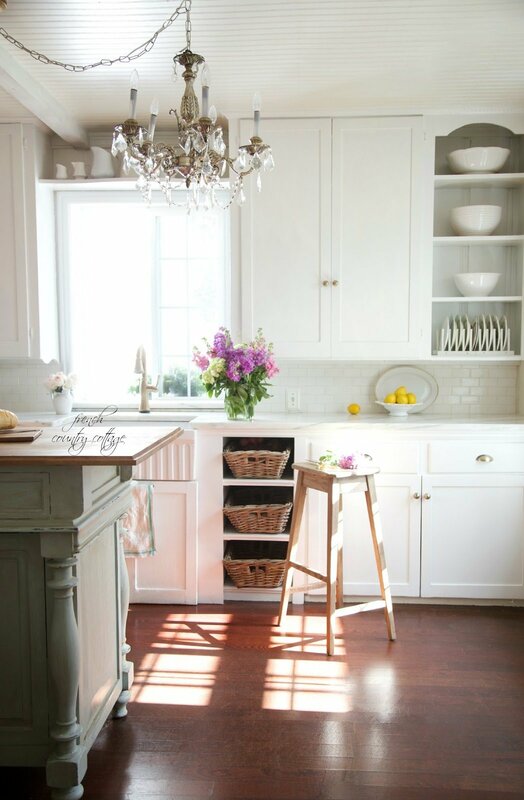 Did you replace your cabinets or a fresh coat of paint? I noticed when I clicked on the SHOP link to Lowes for the island, it is not the same island in your January 2017 blog...may I ask where you found the one you have in your kitchen? The legs/base is much prettier than the one the SHOP link sends me to. Thank you! The old island was years old - we originally found it at Costco I believe. But there was no link to share since it had not been in stock for some time. I just tried to find one that was similar. We have a completely different island in our kitchen now.